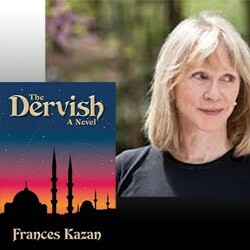 Join us for a book talk & signing of The Dervish written by Frances Kazan. Based on first-hand accounts of the Turkish nationalist resistance, The Dervish is an adventure story that details the extraordinary events that culminated in 1923 with the creation of the Republic of Turkey. Mary Di Benedetti, an American war widow, joins her family in Constantinople in 1919, during the Allied occupation. Befriended by Halide Edib Adivar, Mary becomes involved with followers of Mustafa Kemal (later Ataturk). All attendees are required to read the book prior to the book club meeting. After the discussion, the author will be available for book signings. The discussion will be moderated by the author herself! In 2004-5, Kazan co-produced a retrospective of the movies of Elia Kazan, with the Tribeca Institute and Tribeca Film Festival. From 2007-10, she co-produced a play, in conjunction with Target Margin Theater, about the unique collaboration between Tennessee Williams and Elia Kazan on the play “Camino Real”. Frances Kazan has two adult children and has lived in New York City for more than thirty years. Every week she volunteers at a shelter run by Sanctuary for Families – a private non-profit organization that helps abused women and children. Her interests include performance art, dance, hiking, reading, opera and contemporary classical music. Her travels have taken her to almost every country in the Middle East, India, Bhutan, Tibet, Russia, Peru, Brazil, Argentina, Chile and many countries in Europe. She holds undergraduate and Masters degrees from and New York University and is a member of PEN and The American Turkish Society.